THE PICKIEST EATER IN THE WORLD: WHODUNNIT?! MURDER MYSTERY NIGHT AT EDSA SHANGRI-LA HOTEL! 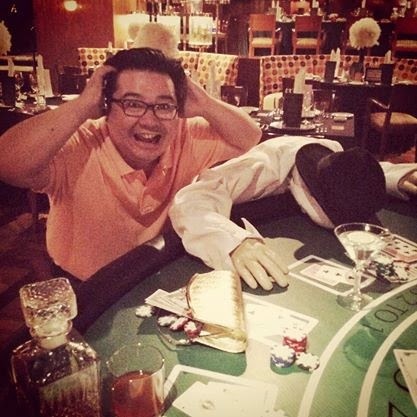 I've been to quite a few unique dining events during my short career as a food blogger, but without a shadow of a doubt, the Murder Mystery dinner held at Edsa Shangri-la Hotel's Paparazzi restaurant is truly one of the most memorable! Not only are you entreated to a fantastic 4-Course meal prepared by none other than Paparazzi's Executive Chef, Robert Cauchi. As I arrived at the mezzanine of Edsa Shangri-la Hotel, I couldn't help but be initially taken aback by the crime scene cordoned off at the area in front of the restaurant. This was essential to setting the mood for what would be a night of mystery, coupled with loads of laughs! As we gathered outside the restaurant enjoying some cocktails, the actor playing the detective was already mingling with guests, asking some questions, and getting more information on possible "Suspects". Two of the "suspects", the Card Dealer and the Cocktail Waitress joined in on the fun as well, with the waitress showing off a little naughty but fun side. The other bunch of "Suspects" is a Wealthy (or should I say, snooty) Tourist..
And his wife who has an obvious appetite for the finer things in life. The subject of the investigation? The murder of "Donny Six Fingers", which seemed to have happened right under our noses. But who could have done it? As our meal began, we joined the detective in gathering clues to help solve the crime. The game was definitely afoot! The first course served was the Yellow Fin Tuna Carpaccio. I wasn't planning on eating it because I usually don't eat raw food, but I was honestly just so hungry that I decided to give this a shot - and whaddayaknow.. It was pretty darn good. The sear on the tuna was practically faultless. The edges were lightly cooked with the center shining a vibrant red. The Tuna was then topped with a caper and shallot remoulade, with an avocado and truffle tarte on the side, for an extra punch of flavor. In between courses, the actors would come out and enact scenarios, asking participation from the audience, resulting in hilarity! I know I've made a name for not being a fan of vegetables, but if they all tasted like the Pumpkin Tortellini, then the name of my blog may very well have been much different. The plump, delicately wrapped tortellinis are filled with luscious pumpkin puree, and generously glazed in creamy butter, before being topped with fresh sage. The actors even played games with the guests! The winners were treated to some awesome prizes from Edsa Shangri-la! The third course, The Lamb Cutlets "Milanese Style", seemed like a dish specifically made for me. I absolutely love lamb, and this reaffirmed it for me. Gorgeous cutlets of lamb are stuffed with creamy buffalo mozzarella covered in a light batter, before being pan fried to golden perfection. Keeping up with the Casino theme, our dessert was a sweet treat in the shape of a playing card! The Millefoglie of Chocolate. Rich White Chocolate Mousse sandwiched between thin layers of Dark Chocolate "Cards". the bottom layer lays a subtle rose water "gel" that gives the dish another dimension of texture. By the end of the meal, we were asked for our answer on who we believe the culprit was. Eventually, the clues that would lead us to the killer was presented, and the true identity of the killer finally revealed. The members of the Get Real Theatre Company HK, were outstanding, with their improvisational skills razor sharp. The Murder Mystery night was truly a memorable experience.. We had a great time trying to solve a murder, and non stop laughter all night long! 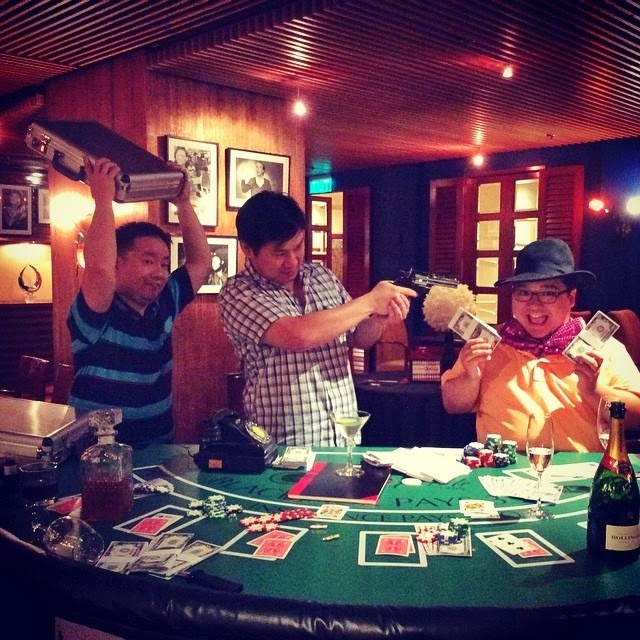 The Murder Mystery Night Dinner cost P3,450++ per person. If you missed the Murder Mystery Night, fear not, because Paparazzi will be holding another Dinner Theater production! 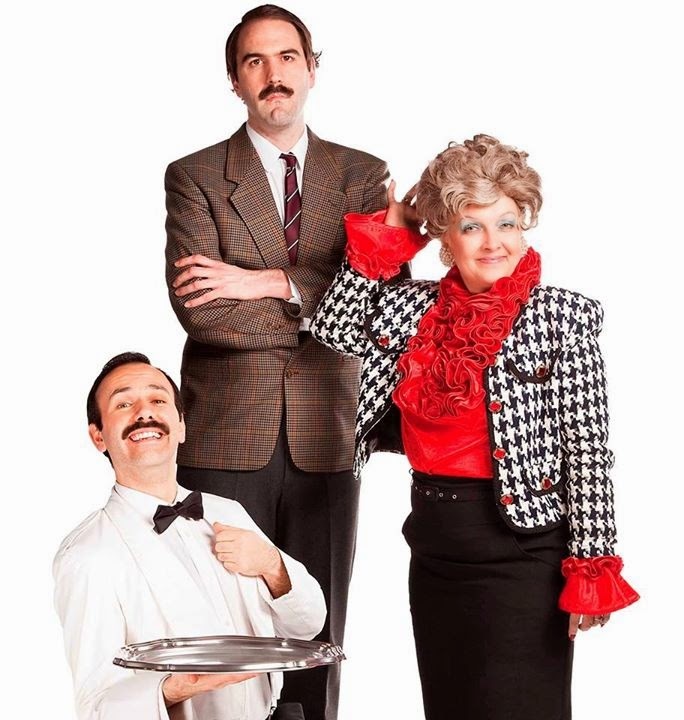 Witness a hilarious battle of wits with Faulty Towers, a long loved and internationally-heralded dinner theatre production by Interactive Theatre International, taking place at Edsa Shangri-La, Manila\'s Paparazzi restaurant on October 2 to 4, 2014. Roll with the punches and don’t miss out on this deliciously entertaining evening, complemented by a special four-course dinner by Executive Sous Chef Robert Cauchi. After an evening of laughs and great food and wine, come stay the night at Edsa Shangri-La, Manila as special room rates are on offer which include breakfast at HEAT and two (2) seats at the Faulty Towers Dinner Theatre at Paparazzi, taking place from October 2-4, 2014.